It could be argued that politician-turned-actor (and failed Presidential candidate) Fred Dalton Thompson more or less played himself each time he stepped before the cameras for a film or TV role. Indeed, he actually did play Fred Dalton Thompson in Marie, Roger Donaldson's fact-based 1985 drama about Marie Ragghianti, the former head of the Tennessee Board of Pardons and Paroles who lost her job after refusing to play along with corrupt superiors. Sissy Spacek played Ragghianti, while Thompson, in a bold stroke of casting, appeared as Ragghianti's attorney, Fred Dalton Thompson. Not surprisingly, Thompson was very convincing in his role. Very surprisingly, he proved to be a natural-born actor, earning respectful reviews for his ability to effortlessly convey homespun wisdom and moral authority, attributes that would facilitate his enjoying an improbably successful. decades-long acting career. Before Marie, Thompson -- who died of lymphoma Sunday in Nashville at age 73 -- was best known for his role in another real-life drama. As a minority counsel to Republicans on the Senate Watergate Committee, he was the one who famously asked, during a nationally televised 1973 hearing, former White House aide Paul Butterfield: "Mr. Butterfield, were you aware of the existence of any listening devices in the Oval Office of the President?" Which, of course, signaled the beginning of the end for Richard Nixon's presidency. In 1994, Thompson re-entered the history books by getting elected in Tennessee to finish the Senate term of Al Gore, who had vacated his seat to serve as vice-president. By that time, Thompson already had established himself as a journeyman character actor in a variety of film and TV gigs -- including No Way Out, Days of Thunder and The Hunt for Red October -- that came his way in the wake of Marie. But it was not until after he left the Senate in 2002 that Thompson landed his signature role: Arthur Branch, the firm but fair-minded (and unabashedly conservative) Manhattan district attorney who occasionally clashed (though never for very long) with his more left-leaning ADA, Jack McCoy (Sam Waterston), in Law & Order. Thompson played Branch for five seasons, both in the "mothership series" and its various spin-offs (Special Victims Unit, Criminal Intent, Trial By Jury, etc.). And while the part certainly did nothing to enhance his stature during the 2008 Presidential campaign -- he was an early flame-out in the race for the GOP nomination -- it did solidify his image as a blunt-spoken authority figure with a disarmingly folksy manner, a self-deprecating sense of humor, and a steel-spined, rock-ribbed determination to do the right thing. I have no doubt that some of my snarkier colleagues will mark the occasion of Thompson's passing to make rude comments about his thwarted political ambitions, his sideline as a TV commercial spokesperson for reverse mortgages and, most unfairly, his allegedly limited range as an actor. Fine. But this bleeding-heart Leftie would prefer to remember Thompson as a reliable workhorse who consistently managed, especially in his later years, to infuse major and minor roles with an air of no-frills gravitas and, yes, a sense of moral authority, without ever spilling over into sanctimoniousness. He didn't grandstand, he didn't (well, OK, hardly ever) steal scenes. Rather, like a classic character actor, he served his characters, and the movies in which they were contained, very well. Two recent examples: In The Last Ride (2012), a fanciful indie drama about the last days of Hank Williams (Henry Thomas), Thompson appeared fleetingly but effectively as Williams' stressed manager, economically but vividly conveying the profoundly mixed emotions of those who knew and loved but frequently were driven to distraction by the self-destructive country music star. More recently, Thompson co-starred in 90 Minutes in Heaven (2015), his final film, a faith-based drama based on Baptist minister Don Piper's account of his near-death experience. For a lengthy stretch of the film, as he recovers from horrific injuries sustained in an auto mishap, Piper (Hayden Christensen) is wracked by near-constant pain, beset by bouts of depression (at one point, he stops trying to breathe on his own), and bedeviled by guilt and shame as he feels altogether unworthy of the prayers and attention paid by family and friends. As I wrote in my Variety review: "[I]t takes a stern tough-love admonishment from an old friend and fellow pastor (played by Fred Dalton Thompson with all the authority he conveyed during his years as a D.A. on TV’s Law and Order) before Piper begins to realize that he’s doing the people who care about him a grave disservice by hindering or repulsing their efforts to provide support and encouragement. Yea, verily: When Thompson issues his soft-spoken but straightforward warning — 'You really need to get your act together!' — his words have the impact of divine revelation." I am sure there are lots of other actors -- "real" actors, versatile guys who get nominated for Oscars and other glittering prizes -- who could have played that scene just as well as Thompson. But, truth to tell, I can't think of many who could have done it better. 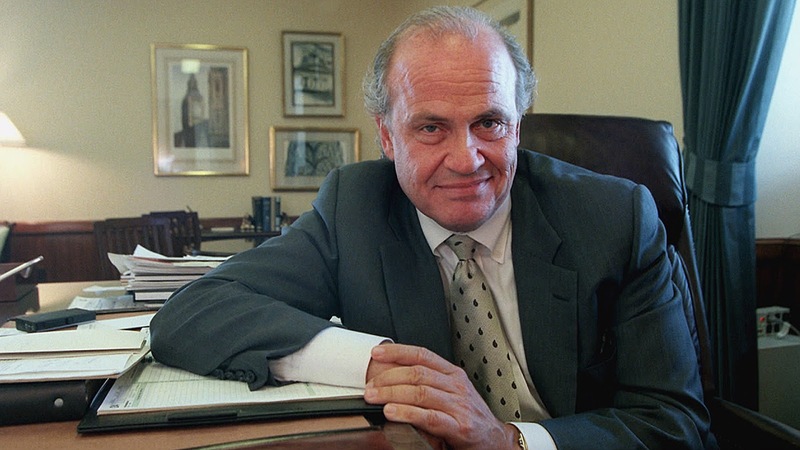 Fred Dalton Thompson was an under-rated, ever-dependable professional. He'll be missed.